...since my last view of a sunset from Mauna Kea. Tonight is the final night of a three-night run on the summit and I'm feeling it! Due to various scheduling reasons I didn't really have any summit time in December and I was planning to take vacation in January. Unfortunately, that was canceled due to Pam's illness but since I wasn't planning to be around, I wasn't scheduled to be at the summit. Those two months at sea level certainly made the effects of the altitude a little more noticeable although it wasn't long before I was back in my groove. Alessandra, an astrochemistry PhD student and scientific collaborator from The University of Nottingham is observing with me after spending a few nights at Gemini. She definitely improves the atmosphere in our control room with her delightful Italian accent! Unfortunately for her the first two nights of this run were rubbish. We were open the first night but high winds made it difficult to take any useful data and even higher winds and high humidity, plus a nice dust storm inside the dome meant that we remained closed most of the second night. Tonight the winds have calmed, the sky is fairly clear although at sunset there was cloud to the south west - the sort that helps to make the sunset look pretty! 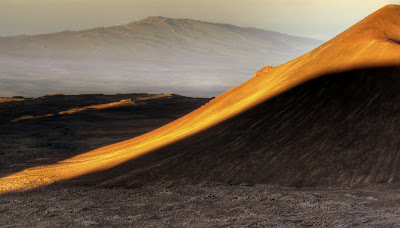 The picture above was the view from just outside the UH 88-inch telescope looking north to west with Gemini to the left, the cinder cones which run from the summit area down to the Saddle in the middle and the shadow of Mauna Kea to the right. Walking back down from the UH 88-inch I stopped to take this (HDR) photo of UKIRT against the setting sun. That wouldn't have been possible yesterday evening, my camera would been blown off the mountain and my face sandblasted. Moonrise and the shadow of Mauna Kea taken at sunset this evening from the summit. January's full moon is called the wolf moon, a name that can be traced back to native American Indians who described the moon after the packs of hungry wolves that would howl outside their villages at this time of year. This year's wolf moon is also the largest and brightest full moon of 2010. The apparent size of the moon depends on where it is in its orbit around the earth. Since the orbit isn't circular but elliptical, there's a point at which it is closest to the earth (perigee) and of course a point where it is furthest from the earth (apogee). When a full moon just happens to occur around perigee, as it is tonight, the full moon appears larger and brighter. Tonight also sees some pretty spectacular action from the US army at the Pohakuloa Training Area (PTA) between Mauna Kea and Mauna Loa. After waking up this afternoon I took a stroll outside at Hale Pohaku and could hear machine gun fire, jet aircraft, artillery and bombs. Tonight, up on the summit, we could see the light from the flares and explosions reflected in the clouds below us. They stopped at around 10pm. Time for bed I guess. I put together a Flickr slide show of some of my favourite pictures from the last year or so that have appeared on this blog. I hope you enjoy the show. You can see a much larger version using this link. 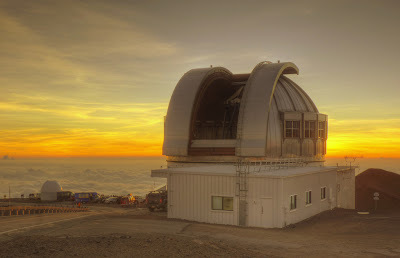 It's a shame I can't use any music to accompany the show, but when I first played the slide show I listened to one of my favourite slack key guitar songs, "The Beauty of Mauna Kea" by Keola Beamer. If you have the song or have access to it online, you might consider playing it! 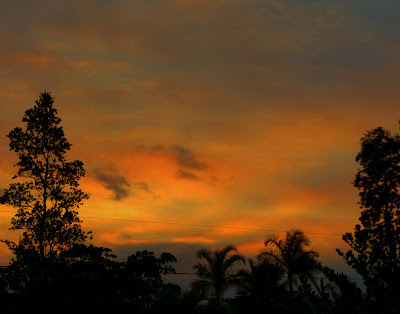 Conditions here on the windward side of the Big Island of Hawai`i have been interesting to say the least. The Kilauea volcano is extremely active in two spots and the amount of volcanic gases released into the atmosphere and subsequent vog is much greater than at any time since I first moved here over thirteen years ago. Couple this with the effects of the current El Nino conditions: light and variable winds rather than the usual trades and a rather severe drought we're facing a couple of problems - a critical lack of water and a sometimes rather nasty atmosphere. It has not rained at my place, at least not more than a few drops, since the storm I wrote about over a month ago. If this is anything like the last strong El Nino event, we may not have decent rainfall for another month or two, although we may get a little later this week. Let's hope so! Many people here do not have access to county water, instead they use a catchment system to collect rainfall which is then used as their domestic water supply. This includes me but fortunately I don't use much water so I'm not in trouble for now, but many families are running out of water and many are reporting a two-week waiting list to have water delivered. I think some water hauling companies are delivering faster than that, but it's clearly a difficult situation for many. Below is the view half an hour later after the sun had set. The sky is a very strange colour due to the vog, a sort of cross between a pink, orange and red. Many of the clouds in the picture are not true clouds but vog from Kilauea. This is certainly one of the more interesting places to live on our planet. 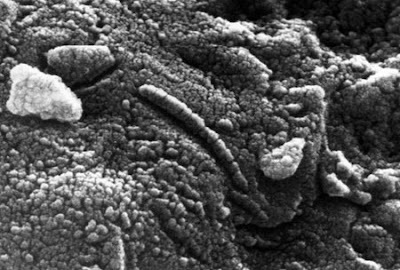 "Lord Rees, the president of the Royal Society and Astronomer Royal, said such a discovery would be a moment which would change humanity." PS. For those interested in news of Pam, she had surgery on Friday 22nd and is currently in the critical care ward in Cedars-Sinai, LA. I spoke to her this evening (and have been in touch with her family and friends) and she is doing well. She has been particularly appreciative of the support from friends and colleagues of mine. You know who you are and I also want to add my thanks because it has meant a lot to both of us. 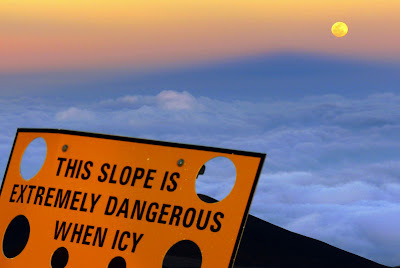 "Thirty Meter Telescope sees all" by The Lack. 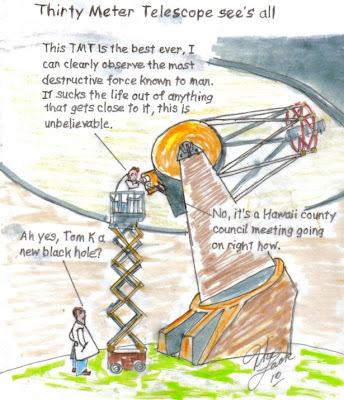 If I could draw cartoons the only thing I'd change here is swap Hawai`i Island's county council for the British government and the STFC. I can't remember where I saw it but I remember someone suggesting STFC should stand for the Science & Technology Foreclosure Council. They certainly hit the nail on the head. Anyway, this is supposed to me observing on the future TMT. Tom Lackey, or "The Lack", cooks and sells the best huli huli chicken on the island. He is a cartoonist in his spare time, more often than not lampooning the local culture and especially our county council who certainly haven't covered themselves in glory over the last few months. I like this man's sense of humour! It was a spectacular sight last night. Shortly after sunset a thin crescent moon was visible with the dark side illuminated by earthshine, i.e., sunlight reflected off the earth onto the moon and back again. Just a few degrees away was Jupiter. There was little time to think about how to take the photographs correctly so just snapped away and hoped I'd get something. This is something you can only see for a few hours each month. 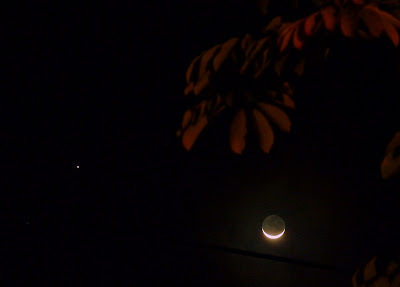 It has to be close to a new moon to see earthshine and the new moon won't do it since it'll rise and set with the sun. During the day the sky is too bright to see the dimly lit dark side of the moon but for an hour or two after sunset (or just before sunrise - it depends whether the moon is waxing or waning) the moon looks very different. You need a clear sky as well of course! Just in case anyone wondered if I'm still around, I'm here and am still reading my friends' blogs. The last month or so has been one of the most difficult times of my life and I still don't know what the future holds. I've not blogged much because I just haven't been in the mood to do so. Hopefully I'll be back at the summit at the end of the month and the pictures will start again. At some point I'll definitely have to get myself back to normal! Thanks for all your support so far, it means a lot to me. This is where I grew up. I even go back there from time to time. I thought this video was a spoof at first but think it might be a genuine advert for Bracknell from 1979 with some stuff added on later. I was 12 years old then and this video definitely brings back memories of the place. I lived in Easthampstead, which is featured briefly, and Point Royal, a bizarre block of flats in the middle of a field where I first learned to play cricket is there as well. It was Sean Connery's home in the movie "The Offence". Winds have been light and variable here and the vog is bad. It's made for some surreal sunsets as viewed from home. 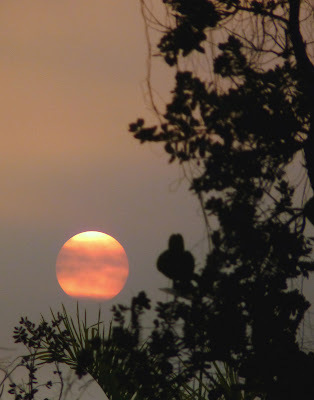 They're not stunningly beautiful or anything like that, the current El Nino conditions have meant clear skies for many days, but as the sun gets low the volcanic particles in the atmosphere dim the light so much you can look at the sun directly without being blinded. Today, when I took these pictures, it wasn't so bad, we experienced some onshore winds that dissipated the vog to some extent, but driving into town on Saturday afternoon reminded me of an autumn drive in the UK - although it was daylight nearly everyone had their car headlights on. Opening the the side window reminded me that this wasn't the UK - the fog smelled of sulphur!